Philadelphia, is bringing a duo of exciting innovation to the category this spring, with the launch of two brand new products. Philadelphia Flip & Dip brings a fun and fresh twist to dipping, combining a unique ritual whereby the product is flipped upside-down to release delicate and lightly whipped Philadelphia topped with one of three delicious sauces. Perfect for dipping into, the innovation is available in three mouth-watering variants: Sweet Chilli, Mexican Salsa or Caramelised Onion. To complement the new range, the brand is also launching Philadelphia Simply Dip - a new intense taste experience with a velvety, melt-in-the-mouth quality. The new packs include creamy yet lightly textured Philadelphia in two flavoursome variants, Olives and Herbs. With a host of seasonal sharing occasions such as picnics and barbeques on the horizon, this new innovation provides a great opportunity for retailers to drive sales as we move into the summer months. 1Prices are recommended only. Retailers are free to set their own prices. 2 Prices are recommended only. Retailers are free to set their own prices. Dairylea, the UK’s number one Snacking Cheese brand1, is bringing a delicious new addition to its Dunkers range this spring – Dairylea Dunkers Nachos – which features tasty tomato salsa-flavoured mini tortilla chips to dunk into creamy Dairylea cheese. Our consumer research shows that flavoured accompaniments to our Dairylea cheese provide a great opportunity for growth2 within the range. We hope that this new innovation will bring some excitement to the chiller aisle, as well as offering consumers a snack that is not only tasty but provides a good source of calcium too3. What’s more, Dairylea Dunkers Nachos will be supported by a £1.4m Dairylea marketing campaign, which will build on the strong performance of our Dairylea Knights TV campaign and reach over three quarters of UK households later this year. Keep your eyes peeled for further details. Consumers will be reminded of how quickly a delicious meal can be made with Philadelphia Simply Stir in its latest TV advertising campaign. Consumers will be reminded of how quickly a delicious meal can be made with Philadelphia Simply Stir in its latest TV advertising campaign launching on 10th November. The 20-second ad features a couple making time to create a romantic dinner during a busy evening and highlights the ease of using Simply Stir to create a mid-week meal. Part of a £1million UK marketing investment for Philadelphia Simply Stir, the ad will feature in prime-time slots over three weeks, including The X Factor, I’m a Celebrity Get Me Out Of Here and Surprise Surprise. In addition to TV advertising, the brand will also highlight how delicious meals can be quickly created with Philadelphia Simply Stir on Facebook, posting midweek meal makeovers throughout the year. So what does that mean for the you? Philadelphia is bringing even more excitement to the range this October with two new flavours, Mediterranean Tomato and Smoked Ham. Philadelphia, the UK’s number one soft white cheese brand1, is bringing even more excitement to the range this October with two new flavours, Mediterranean Tomato and Smoked Ham. The launch builds upon the huge success of previous flavour combinations in the brand’s savoury range, including Garlic & Herb and Salmon & Dill, and is aiming to bring new consumers to the category and drive incremental growth. Why should you stock this product? The Philadelphia brand is worth £101 million and is growing at 1 per cent2. The brand is being supported by high-profile marketing campaigns this year, including TV advertising, keeping it front of mind with shoppers. Savoury is a key driver for penetration growth in meals such as lunch and dinner, helping to open up soft white cheese to an even wider consumer base. Philadelphia is back on TV this January, encouraging viewers to enjoy what they eat with the versatility of the UK’s number one soft white cheese. Philadelphia is back on TV this January, encouraging viewers to enjoy what they eat with the versatility of the UK’s number one soft white cheese1. The ‘Love Life, It’s Delicious’ campaign, airs from the 18th of January until the 23rd of March, depicts Philadelphia at the very centre of beautiful, surprising and glamorous food stories, marrying food pleasure with the realities of modern day eating and reminding consumers of its uniquely delicious and creamy taste. The ad airs during some of the nation’s favourite programmes, including Dancing on Ice, Coronation Street, Emmerdale, Hollyoaks and Take Me Out, amongst others. The advert, which is Philadelphia’s biggest investment in television for five years, will be a mixture of 30 second and 10 second slots and will also be supported with digital activity. Check out the advert below or on the Philadelphia YouTube page. Our latest innovation from Dairylea are two deliciously different flavours, Dairylea Mighty Mature and Dairylea Springy Onion. 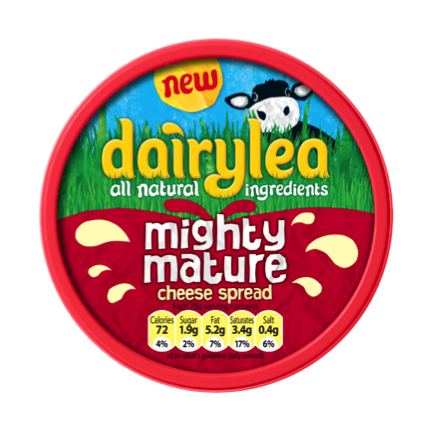 Our latest innovation from Dairylea are two deliciously different flavours, Dairylea Mighty Mature and Dairylea Springy Onion. Available in 160g tubs, both cheese spreads are made with Dairylea’s all natural recipe following its reformulation last year, and are the first ever flavours for the Dairylea range! We’re supporting the whole Dairylea range with national advertising, in-store activity and social media and have got lots of things planned over the next 12 months to get shoppers excited and help drive sales in your store. Excite mums’ with new options for lunchbox sandwiches. New innovation to add flavour to your chiller cabinet. They’re already available in depot. Our culinary geniuses at Philadelphia have been hard at work creating a new easy way to cook with our delicious cream cheese. Our culinary geniuses at Philadelphia have been hard at work creating a new easy way to cook with our delicious cream cheese. New Philadelphia Simply Stir is a ready-made cooking sauce, for your customers looking to make a quick and easy evening meal. It’s available in two mouth-watering flavours, Mushroom and Garlic & Herb. 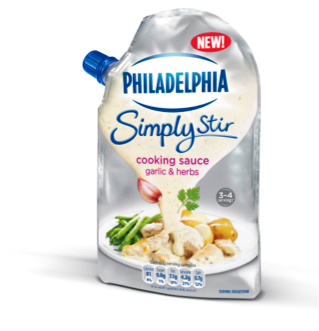 Philadelphia Simply Stir is in a unique re-sealable pouch to have visable standout on shelf. We recommend merchandising it next to Philadelphia in your chiller unit. It’s priced at £1.99(RRP)* and is already available for you to buy in depots. We’re confident customers are going to like how simple and convenient it is to cook with. We’re supporting the range with national advertising, sampling and social media. They’ll also be a range of meal ideas for you and your customers to download and help drive sales in your store! Offering a complete meal solution can drive sales when you cross offer categories, for example meat and pasta.